Assistant Coach KrKa Novo Mesto (November'03-December'03)…Head Coach KK Split (December'03-2004)-Head Coach Slovan Ljubljana (2004-December'04)…Head Coach Iraklis Thessaloniki (December'05-April '06)…Head Coach Bosna Sarajevo (2007-08)…Head Coach BC Olimpija Ljubjana (December'08-April'11)...Head Coach Spartak St. Petersburg (2011-2013)...Head Coach Royal Hali Gaziante (November'13-December'15)...Head Coach AEK Athens (December'15-2017)...Head Coach Cedevita Zagreb (2017-....). won the 2007-08 Bosnian National Championship with Bosna Sarajevo…won the 2008-09 Slovenian National Championship with BC Olimpija Ljubljana…won the 2004 Croatian National Cup with KK Split…won the 2009, 2010 and 2011 Slovenian National Cup with BC Olimpija Ljubljana...won the 2018 Croatian National Cup with Cedevita Zagreb…won the 2010 Slovenian Super Cup with BC Olimpija Ljubljana...won the 2017 Adriatic League Super Cup with Cedevita Zagreb. named the 2011-12 EuroCup Coach of the Year. 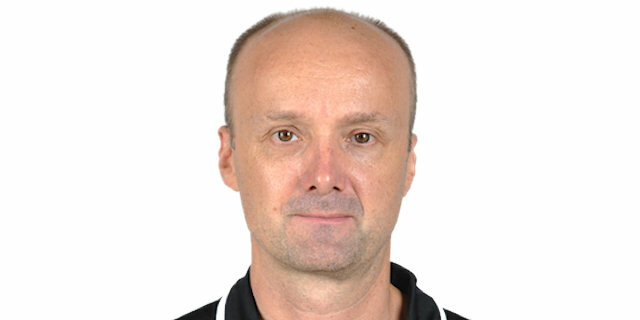 Head Coach Slovenian National Team (2008-09, 2014-15).